I have exciting news about the latest and greatest paddling sport – Greenland style SUP’ing. I just invented it! Yesterday! Back to the story of my great invention … yesterday my beloved and I went out to the Ghost reservoir to play around with a racing SUP and a Delta 16. Long story short, I forgot my SUP paddle but had brought my new Greenland-style sea kayak paddle. A Greenland-style kayak paddle (or GL paddle) is the result of thousands of years of design evolution by the hunter/kayakers in Greenland. While it looks like a fancy 2×4, it is far more than that, believe me! GL paddles are growing in popularity because they are easier on the body than the usual “Euro-style” paddles that you normally see. Its design allows for a variety of paddling styles, each developed for different weather and/or sea conditions. GL paddles are also optimized for the easiest style of rolling out there – it is what we teach in our rolling clinics. Anyways, as I was saying, I forgot my SUP paddle. So not wanting to wreck our paddle day, I paddled with the GL while standing on my race SUP. It worked okay. The design shape of the GL paddle was quite comfortable in my hand, although I’m sure those hunters did not foresee that. 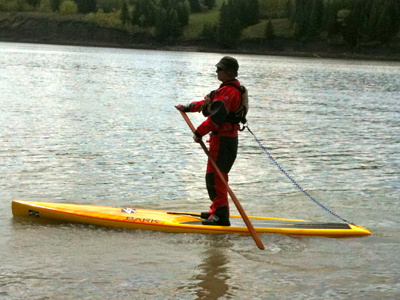 In SUP we sometimes kneel in rough waters, and the GL was great – I used it kayak style. GL SUP has everything going for it! SUP is exploding in participation. And GL paddling is also experiencing huge growth right now. Now that I’ve combined the two, watch out! I just need to get Jennifer Anniston out trying “Greenland-style SUP” with the paparazzi nearby and the world is my oyster. You read it here first! Still, next time I’ll try to remember my SUP paddle.